When we decide how much money we can spend in the present year of retirement we need to know not only how much spendable wealth we have today but our best guess of how much we will have in the future. Likewise, on the expense side of the ledger, we need to know not only what our expenses were last year but also our best guess of what our expenses will be in the future. We can spend less this year, for example, if we know there is a big expense looming in the future and more if we’re pretty sure we’ll have more money in the future, say a sizable inheritance. In short, we need a model of our retirement future to properly plan for it and even to determine a safe amount to spend this year. Of the four inputs to this model I just mentioned, only one, our current wealth, is fairly certain. If our entire future income will come from annuities, pensions and Social Security retirement benefits then it's relatively predictable, too. To the extent that future income will come from investments, that income is fairly unpredictable. Expenses are unpredictable, as well. All we know for sure is how much we spent over the past few years. We can’t even be certain of the coming year’s expenses, so they too are uncertain. Retirement spending studies have shown that spending tends to decline as we age [2,3] but it doesn’t for everyone so we can’t assume that ours will. According to David Blanchett, whether or not it declines, annual spending volatility is relatively high (unpredictable from one year to the next). When we take spending shocks into consideration, the future spending becomes even less certain. I spent $15,000 in the past year for two HVAC systems that I expected would last at least five more years. That has a much greater impact than my cable bill going up 5%. The primary determinant of retirement cost is longevity. A five-year retirement will be far cheaper than one of 35 years. Our individual life expectancy is completely unpredictable assuming we are healthy. As researcher Larry Frank keeps telling me, everything in an individual household’s retirement funding is stochastic, i.e., unpredictable. 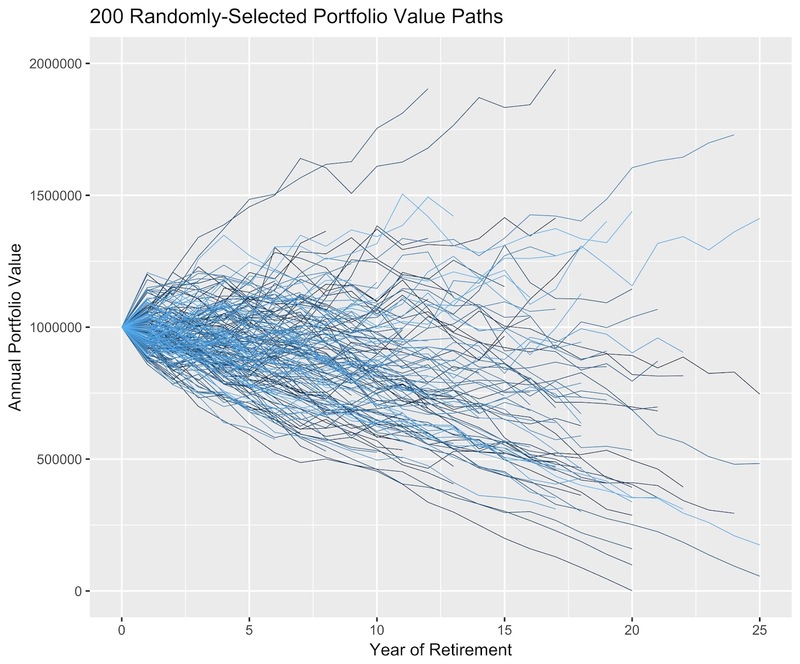 Following is a graph of 200 randomly-selected portfolio value paths from a simulation of 10,000 scenarios for a retiree with a $1M portfolio from which she plans to spend $45,000 a year. All calculations are in real dollars and life expectancies are randomized using actuarial tables. It assumes a real 5.25% expected market return with a standard deviation of 12%. Notice that most terminal portfolio values end up lower than the initial $1M portfolio value in real dollars. In this simulation, the median terminal portfolio value was about $860,000. About 75% of the scenarios ended with smaller portfolio values than the $1M they started with. This is typical of simulation results, though spending less would shift the bulk of those blue lines upward and spending more would do the opposite. The central mass of those blue lines would rotate around the starting point like clock hands, farther clockwise with more spending. That’s like saying we shouldn’t plan outdoor activities because we can’t know future weather conditions with certainty. It’s like saying that companies shouldn’t bother developing business plans because they can’t know future economic conditions for sure. Of course you can plan where outcomes are uncertain and the best way to do that is with probabilities. We develop retirement plans using models of the future but some models are much better than others. Nor is the model a plan. If we schedule a picnic for tomorrow and the weather models predict a 20% chance of rain, calculating the 20% is not the plan. The plan is deciding to take an umbrella or planning a backup activity. As in retirement planning, we use the model results to help create the plan. Another blog suggested that Monte Carlo simulations can generate hundreds of thousands of future scenarios but that using them for planning is a mistake because a retiree can’t know which one she will experience. The first part of that statement is true. Your retirement's future finances might follow one of the blue lines in the chart above — assuming we ignore spending shocks — but it is impossible to know which one is yours. 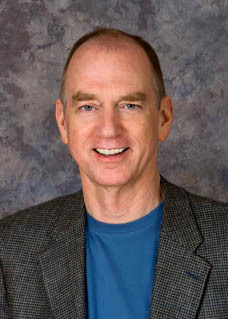 Though it is true that we can't foresee our future path, it is also irrelevant — the purpose of the Monte Carlo model isn’t to predict an individual retiree’s path through the future (that’s impossible) but to explore a broad range of possible scenarios and develop some estimate of the probability of each actually being realized. Simulation is essentially a gigantic "what-if" analysis.